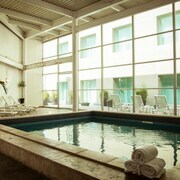 Located in Downtown Mexico City, this hotel is within a 15-minute walk of Zocalo, Palacio Nacional, and Templo Mayor. Palacio de Bellas Artes and Metropolitan Cathedral (Catedral Metropolitana) are also within 1 mi (2 km). Pino Suarez Station is only a 2-minute walk and Isabel la Catolica Station is 8 minutes. 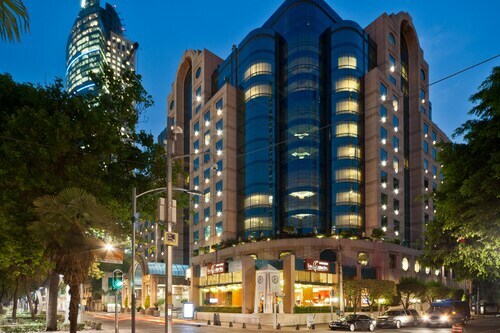 Located in Reforma, this hotel is within a 10-minute walk of Paseo de la Reforma and Reforma 222. Monument to the Revolution and The Angel of Independence Monument are also within 15 minutes. San Cosme Station is 14 minutes by foot and Revolution Station is 16 minutes. 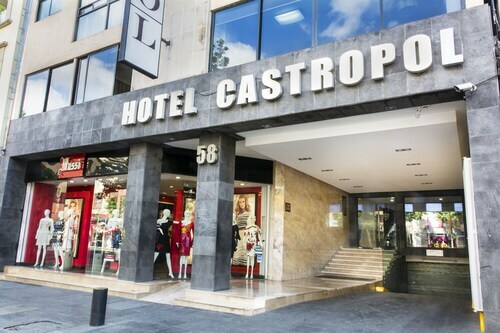 Located in Downtown Mexico City, this hotel is within 1 mi (2 km) of Madero Street, Suprema Corte de Justicia, and Zocalo. Metropolitan Cathedral (Catedral Metropolitana) and Palacio de Bellas Artes are also within 1 mi (2 km). Isabel la Catolica Station is only a 4-minute walk and Pino Suarez Station is 10 minutes. 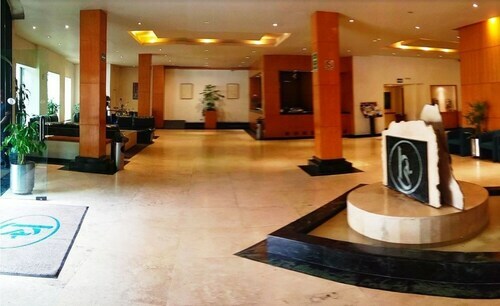 Located in Downtown Mexico City, this hotel is steps from Museum of Light, Museo de las Constituciones, and San Ildefonso College. Templo Mayor Museum and Palacio Nacional are also within 10 minutes. Zocalo Station is 8 minutes by foot and Allende Station is 12 minutes. 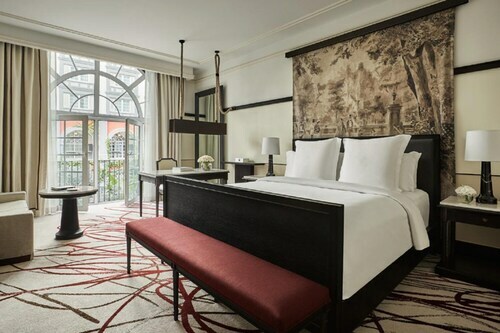 Offering a prestigious location on the Paseo de la Reforma boulevard, the Four Seasons Hotel Mexico City is a 5-minute walk from vast Chapultepec Park and a 15-minute walk from the National Museum of Anthropology. 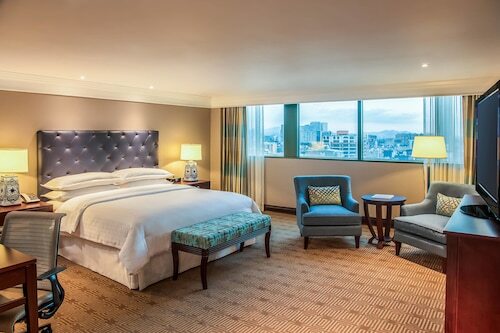 Located in Cuajimalpa, this luxury hotel is 2.3 mi (3.7 km) from Expo Santa Fe Mexico and 2.7 mi (4.3 km) from Centro Santa Fe. Ciudad de los Ninos is 3 mi (4.9 km) away. 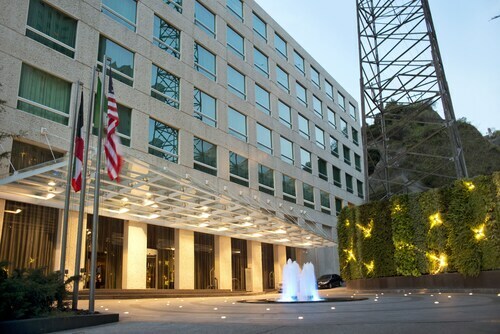 Located in Reforma, this luxury hotel is within a 15-minute walk of The Angel of Independence Monument, U.S. Embassy, and Museo de Arte Moderno. Tamayo Museum of Contemporary Art and Museo Nacional de Antropologia are also within 1 mi (2 km). Sevilla Station is 9 minutes by foot and Chapultepec Station is 15 minutes. 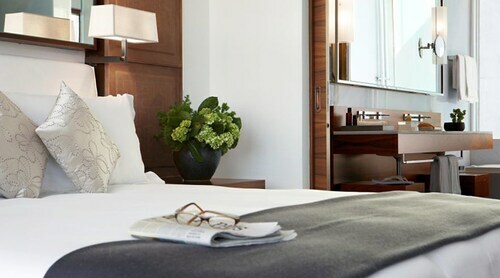 Located in Polanco, this luxury hotel is within a 10-minute walk of Avenida Presidente Masaryk and Chapultepec Park. Auditorio Nacional and Antara Polanco are also within 1 mi (2 km). Polanco Station is 11 minutes by foot and San Joaquin Station is 26 minutes. How Much is a Hotel Room in Mexico City? 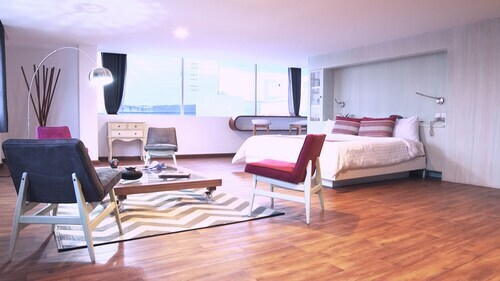 Hotels in Mexico City start at $21 per night. Prices and availability subject to change. Additional terms may apply. Lively marketplaces streaming with colorful fabrics, stunning Aztec- and Spanish-influenced architecture, and pulsating nightlife where you can dance until dawn—discover all of this and more in Mexico City. This sprawling metropolis is big and bold, and offers the experiences to match. Fortunately, hotels in Mexico City are the perfect base for the intrepid explorer. 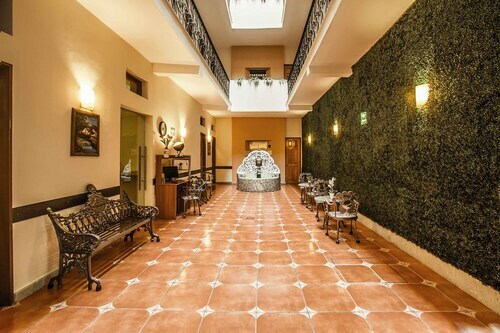 Book one of the hotels near the Bazar del Sabado for a taste of authentic Mexico City. This open-air market takes place every Saturday at Plaza San Jacinto. Buy a hand-painted ceramic vase, that perfect artisan necklace, or an original watercolor by a local artist. Drop your goods back at the hotel, then make your way to the Frida Kahlo Museum, housed in the legendary painter’s former residence. Or spend the afternoon at the historic Plaza de la Constitucion, and at sunset, grab a photo op as Mexican soldiers march out to take down the large flag that flies in the center. For the ultimate in relaxation, reserve one of the hotels with a pool in Mexico City and savor a glass of wine at a rooftop oasis before dinner—or just book a secluded resort to really get away from it all. Edibles abound in this foodie’s paradise. Mexico City hotels in Centro or La Condesa are near the best street food. Search for the unusual pambazo, made of hard, white bread soaked in chili sauce, or tlacoyos topped with sliced cactus, cheese, or salsa. For dessert, listen for the sound of the camote vendors, who serve up hot sweet potatoes drizzled with condensed milk and cream. Wash it all down with a watermelon or lime agua fresca. Heading east, the up-and-coming La Roma neighborhood serves up homemade bread and hip Mexican fusion restaurants. Feeling fancy? For exclusive dining and nightlife, the upscale Lomas area is your wonderland. Find the Latin American flavor that suits your style in the city that’s always caliente. Book cheap accommodations with Travelocity today and vamonos! 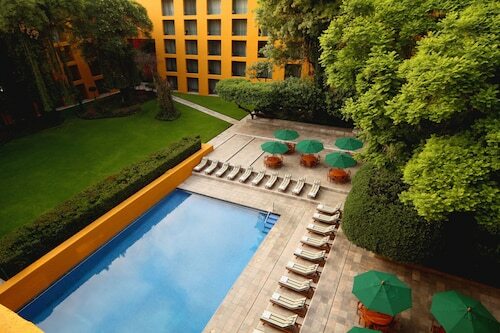 The best hotels in Mexico City await your arrival. 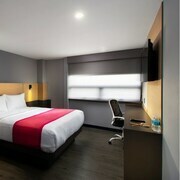 Excellent customers services, comfortable rooms and very clean with great amenities. Accessible to many restaurants museums and parks . would prefer a concierge that could have helped with booking some tourist destinations/events/tours. We liked the location, but can't do much walking outside due to high traffic - however went to a good pizza place just a block away. This hotel is in a great and safe location. The staff is friendly and helpful. 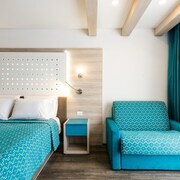 The rooms are elegant, clean, and comfortable. I’d definitely stay here again. The bed had bugs. I had many bug bites and the manager didn't care. Everything was excellent. Save clean excellent customer services.